A nail biting finish to the final of the Suffolk Championship Pairs on Sunday ended with Debby Sutcliffe and Maria Allnutt winning the event for the fourth time. After six and a half hours of play and the result of the final board still awaited, Jane & Andrew Moore held the narrowest of leads over Debby and Maria. But when the last score was punched in via the Bridgemate the positions were reversed. Eric Newman & Mike Sherer were third, ahead of Jo Harpur and Conor Bignell. The winners first landed the Championship Pairs back in 1991-2 and also were successful in 2011-2 and 2014-5. A choice of dishes - including a vegetarian option - is being offered for the next Suffolk bridge lunch on Wednesday 22 May (1pm). Gerry Ford and his daughter, Emily, are both professional chefs and their menu for the event will be Coq au Vin or Leek and Three Cheese en croute with Red Pepper sauce - followed by Lemon and Almond Merinque Roulade or Winter Fruit Salad. The delicious two course lunch + a glass of decent wine - and a 24 board duplicate to follow - costs £17.50p per player, which represents outstanding value. The bridge lunch takes place at the Blackbourne community centre, Elmswell (IP30 9UH). To reserve a place for you and your partner, click on BRIDGE LUNCH and complete the online form. If you prefer to download, complete and post an entry form click on FORM. There will be a Host for this event, so single entries are welcome. Teams of Four, from the same club, for the Thornway Cup. To enter online click TEAMS. To download an entry form click on FOUR. Click on SENIOR to enter online. Click PAIRS to download an entry form. For many years, Suffolk Bridge has run events for Mixed Pairs, Married Pairs and Ladies' & Men's Pairs. Recently, attendance has been limited because events with restricted partnerships on a weekday evening disrupt both players' calendars and their regular partnerships. It is now planned to amalgamate these events into one - the Suffolk Autumn Pairs - to be held on Sunday September 15 in Lavenham Village Hall. Start time will be 12.00 noon and a sandwich lunch will be provided at the interval. Trophies or prizes will be presented to the winners in each historical category (Men, Ladies, Mixed & Married) plus a new Handicap category, providing more opportunities to win (no-one can win in two categories) and no necessity to arrange one-off partnerships. We anticipate playing an extended session of Bridge with a relatively early finish. To enter on-line click AUTUMN. Click PAIRS to download a ‘paper’ entry form. Three significant changes to the Suffolk events calendar for 2019 have been agreed by the county's bridge association. For the first time, the Senior Pairs will be staged at multiple venues on the same day, to enable more players to take part. The competition on Wednesday 10 July will take place in the evening at Clare (its traditional home) and Nowton Park (home of Abbeygate bridge club) and in the afternoon at Ipswich & Kesgrave. Staging events at a geographical spread of locations was one of the suggestions made at a meeting of club representatives organised by the county last year. Another idea from that meeting has resulted in the Ladies, Mens, Mixed, Married Pairs being amalgamated into a new Suffolk Autumn Pairs on Sunday 15 September. The SCBA has also responded to the enforced absence of club bridge for up to a fortnight over Christmas and the New Year by agreeing to stage the Bah Humbug Pairs on Sunday 29 December at Elmswell. The new event will involve a late morning start and around 32 boards. In addition to a prize for the overall winners, there will also be a Handicap (based on NGS grades) prize - not to mention the best mince pies in Suffolk and a glass of something festive. More details in due course. Mary Moir, Tony Trathen, Lynda Tibbs and Mark Leggett have every right to smile. They were the winners of the first Relaxed Teams event at the East Anglian Bridge Weekend.The weekend, run by Suffolk in conjunction with Cambs & Hunts and Norfolk, was staged at Elmswell for the first time and the new venue appeared to be well received by competitors. The Swiss Pairs on Saturday attracted 48 entries, the Swiss Teams on Sunday saw 21 teams take part, while the Relaxed Teams, aimed at less experience players, was supported by four teams. The Tractor Boys are very much second best to the Canaries on the soccer ground, but on the field of bridge the honours were shared between the home county and Norfolk. Suffolk county captain Rick Hanley partnered Graham Beeton to win the Swiss pairs, just pipping the Norfolk duo of Giles Ip and Alan Oddie. In the Swiss Teams, Norfolk gained the upper hand with Paul Darby, Steve Dannell, Giles Ip and Mark Hill gaining a last board success over last year's winners - Malcolm & Karen Pryor, Neil Bresler & David Cooper. The third placed team deserve a special mention: Catherine Curtis and Paul Fegarty, who partnered their two talented teenage sons, Liam and Jamie. To see all the placings and scores for the two days click on SWISS PAIRS, SWISS TEAMS or RELAXED TEAMS. Click on PHOTOS to see more of the action. .... and Chris Rickard has added to her collection of post-bridge-event lost property - this time a beautiful turquoise Passigatti scarf. If the owner wants it back, please email paulandchrisrickard@gmail.com. 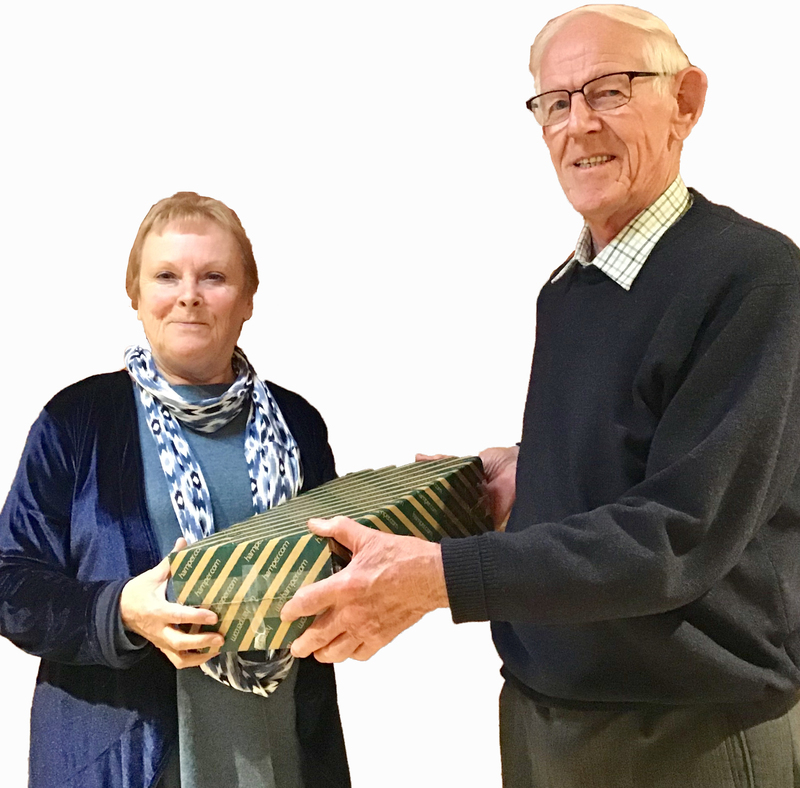 A decent turnout of 30 pairs took part in the Mid Anglia Pairs at Woodbridge on Sunday but it is doubtful if there has been such a wide margin victory in the recent history of bridge locally as that achieved by Malcolm and Karen Pryor. By half-time the England Seniors player and his partner enjoyed a virtually unassailable lead and far from resting on their laurels, they kept their foot firmly on the pedal to finally notch up a score of +125. IMPs - more than 50 IMPs ahead of runners-up Din Gudka and Cathy Rowland. Suffolk captain Rick Hanley and Andre Gray were third. With a reasonable turnout of county players, not to mention England youngsters Liam and Jamie Fegarty who partnered their parents, Catherine Curtis and Paul Fegarty, the annual renewal of the Mid Anglia appeared to be up to strength. To see the full results click on MID ANGLIA. For a flavour of the day, click on PHOTO GALLERY. GOOD MANNERS: Is it too much to ask? Loosely interpreted, the EBUs 'Best Behaviour at Bridge' owes much to Manners Makyth Man, the motto of William of Wykeham - and Winchester College and New College, Oxford - both of which he founded in the 14th Century. Indeed, the EBUs CODE, which asks players to be pleasant to each other and the director, might be better named Best Manners at Bridge. The Suffolk bridge committee is taking a particularly strong line on 'bad behaviour/manners' and cracking down on anyone found to be in breach of the code. As with most counties, the culprits in Suffolk can be counted on the fingers of one hand - but that is a handful too many. To highlight the issue, this website is running a series of cartoon strips devised by Peter Bushby (see below), and an article (click on 2½ No Trumps) by Glyn Button, the chairman of Framlingham bridge club, whose regular blog has delighted so many readers. The Annual General Meeting of the Suffolk Contract Bridge Association will take place at Assington village hall (CO10 5LW) on Sunday 19 May at 3pm - and be followed by the AGM Pairs (click AGM to enter online). Norman delves into a slam hand from the Suffolk Championship Pairs at the weekend. Click on MoreOrLess to find out more. It is never too early to book your annual bridge visit to the seaside! The 39th Suffolk Congress at Felixstowe is the county's flagship event and takes place this year on Saturday 5 & Sunday 6 October at the Pier Leisure Centre. The Championship Pairs are on Saturday, starting at 1pm. On Sunday, the Swiss Teams start at 11am, and the Relaxed Pairs for less experienced players (fewer than 2500 Masterpoints) begin at 3pm. Rick Waters reflects on the ability to think quickly at the bridge table - and away from it. Click on 2½NoTrumps, the antidote to traditional bridge chronicles, to read more. Suffolk’s final match of the season against Norfolk on Sunday ended with mixed fortunes. Rick Hanley, the county captain, analyses a hand from the match in which a Norfolk player tried a cunning pysch! Click on HEARTLESS NORFOLK to read more.